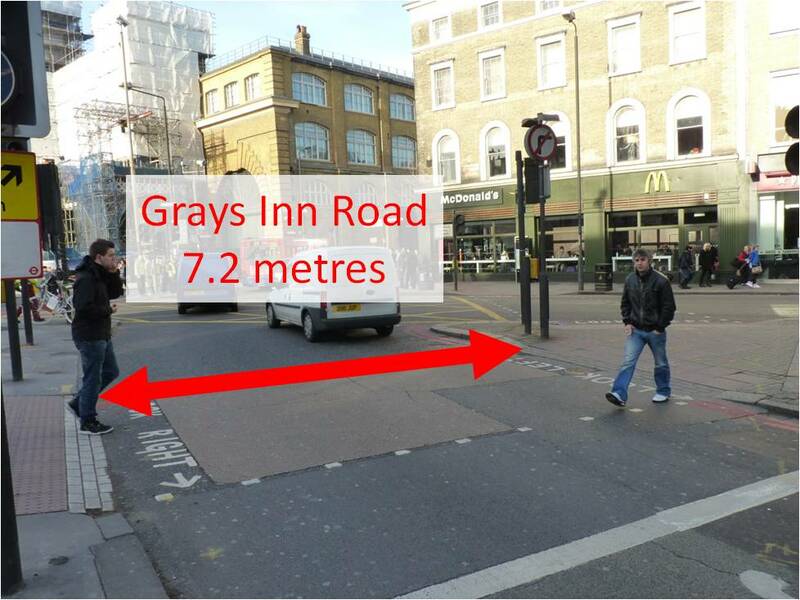 Why did TfL’s killer Kings Cross junction not measure up to TfL’s own London Cycle Design Standards? This site has covered closely over the years TfL’s killer junctions in Kings Cross. We have several dozen testimonies of people’s day to day experiences. The recent death of cyclist ‘Deep’ Lee at the junction of Grays Inn Road and York Way despite explicit warnings to TfL of severe problems at the junction led me to suggest that the police should examine whether TfL is liable under the Corporate Manslaughter and Homicide Act. TfL have largely ignored warnings and persisted over many years with basic design failures at that junction. TfL is about to remodel the junction so I paid it one last visit to the bottom of York Way to try to understand why that junction is so deadly. Armed with a Stanley Surveyors Tape from Franchi I measured the roads during red light stops. In an entirely non scientific process I tied the tape off to a bit a street furniture close to the kerb, scampered across the road, read the mark at the opposite kerb then subtracted the figure where the tied end crossed the kerb. This is accurate to within a few centimetres, if anyone has a theodolite please feel free to repeat this to millimetric accuracy. 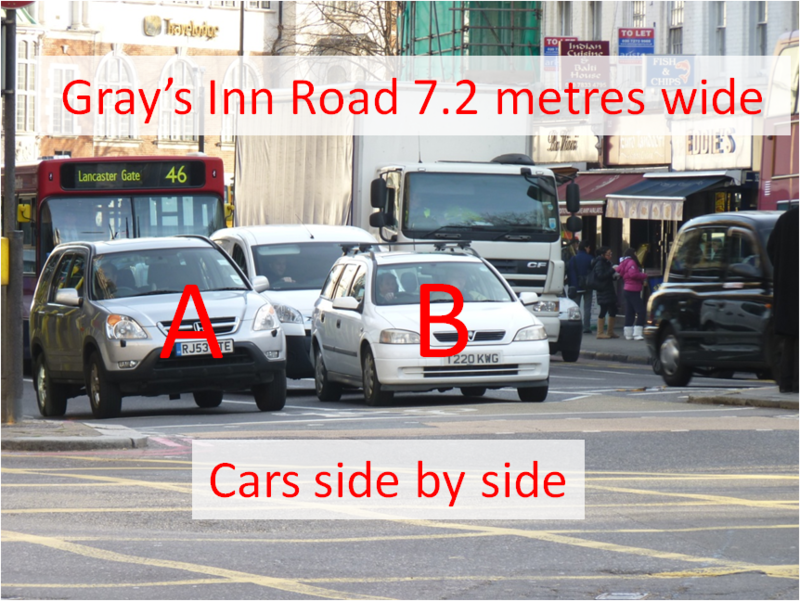 Grays Inn Road (two lanes of traffic) is 7.2 metres wide at the pinch point. 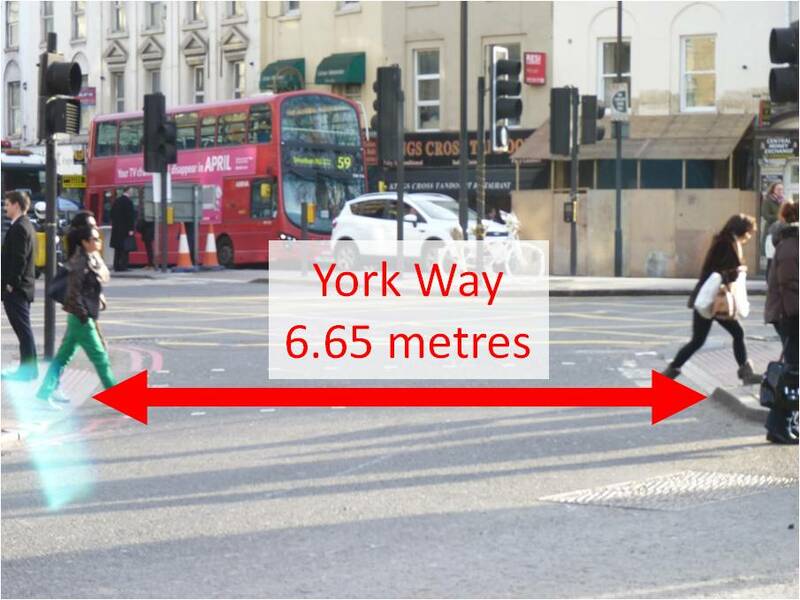 But TfL’s own guidance (see below) says that this type of road should be 8 to 8.5 metres wide – the junction is almost two metres too narrow at the York Way end and almost 1.5 metres too narrow on Grays Inn Road. But crossing from Grays Inn Road to York Way traffic faces a 60 degree right turn as well as a road narrowing. 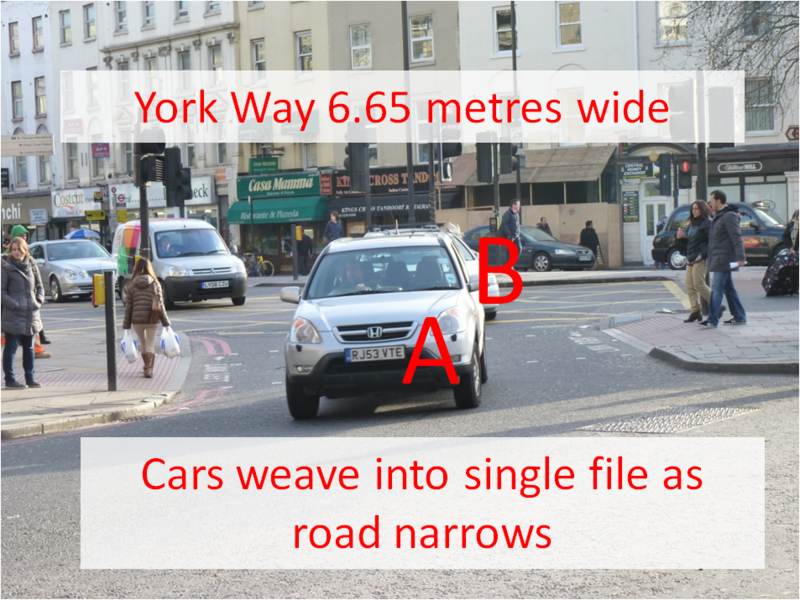 This causes the two lane traffic to weave together into one lane as the two cars A and B demonstrate in the pictures. This is really tough to deal with when you are on a bike. For Deep Lee it was deadly as she sought to find her own space on the road (the police showed me and local Councillors the harrowing footage when they asked me in to discuss the investigation). A narrowing twisting road like this is known as a chicane. • a cycle bypass that allows cyclists to travel past the obstruction without losing priority or having to ‘give way’. So for two lanes of traffic the road should be at least 8.0 and preferably 8.5 metres wide according to TfL’s own guidance at the prevailing speed limit. The road at this junction is at its narrowest 6.65 metres according to my amateur measurements. TfL with the vast resources available to it has been managing a junction for years that does not comply with its own design guidelines, despite stark warnings about safety in reports TfL itself commissioned. This reinforces my calls for a proper investigation of TfL under the Corporate Manslaughter and Homicide Act – in the face of clear evidence about danger the dysfunctional bureaucracy has failed to take adequate action in a timely manner, leading, in my view to death. TfL’s belated plans to widen the junction appear only to have emerged thanks to arm twisting by the Olympics Delivery Authority, and these plans are mired in controversy. Behind the scenes our excellent local Councillors Convery (Islington, Lab) and Braithewaite (Camden, LibDem) are both pressing TfL hard to consult locally and implement plans that work for cyclists. The brilliant Sophie Talbot has enlisted Councillors and GLA members to track down the latest plans TfL engineers are working from, but we can’t even get hold of them. It’s a sorry state of affairs. 16 Responses to Why did TfL’s killer Kings Cross junction not measure up to TfL’s own London Cycle Design Standards? This is really good stuff – to use TFL’s own standards should add a lot of weight. Are there any rules/guidelines about minimum times between traffic light phases as I think this really adds to the problems at this junction: usually traffic is still trying to squeeze into York Way when pedestrians are given the signal to cross and traffic starts to arrive from Euston Road. I think the problem here is that there are 2 lanes from Grays Inn Road trying to get into York Way which very quickly narrows down to 1 lane. What you see here is drivers not adhering to the yellow box and trying to push over. This junction is a mess. It doesn’t help that the Taxis put down right on the junction and there is also a big bus stop. The whole thing is a mess. Dear William thank you for taking the time to do this. It was well worth it and I agree with your call that the question ought to be asked on GLA level. My personal opinion of TfL when campaigning regarding Acton Street noise levels and speeding is that there is a cynical lack of interest. It is part of the utilitarian legacy of Britain. TfL management in case you haven’t noticed yet, we are now governed by the European Human Rights. The infringement, damage or death of one person and worse a group of people through negligence is now a very serious matter. No longer can you argue that the interest of serving the traffic flow is permissive if it serves the greatest number but damages a few. Firstly – thanks for this research. But some comments – it seems that amongst the (relatively minor) changes about to be made to this Kings Cross road layout is the scheme to widen the entry to York Way from Grays Inn Road. However, if it’s easier for 2 lanes of traffic to cross the junction side by side, without vying for space, they’ll just travel even faster. And once in York Way, with the taxi drop-off, and the buses pulling in and out of the queue of buses at the bus stop, and with the parking/delivery bays on the right, there’s usually only room for one lane of traffic continuing north anyway. With one lane of moving cars/lorries, it’s already often a dangerous squeeze cycling up there (as I do almost every day); with two lanes moving up from the junction (having made the 60 degree turn), and finding there isn’t room for them to continue side by side, the situation for cyclists just north of the junction will be even worse than it is already! So the effect of widening the entry to York Way will just move the pinch point a few yards north. What’s needed is _narrowing_ the exit from Grays Inn Road – there should be only one lane for motor vehicles to enter the junction from there, together with a nice wide bike lane (preferably with its markings continued across the junction to reinforce awareness). But with current TfL priorities, none of this will be done, because they refuse to make changes which will switch road resources away from cars etc, and insist that any changes must at least maintain the existing speed and volume of motor traffic. It’s because of the clear need to overturn this current TfL approach that the action on Monday, which Sarah mentions above, has been initiated. I hope that, at 6pm on Monday, large numbers of people will reclaim the Kings Cross roads for people rather than machines for an hour. See you there? To answer Williams point this split was obviously put in place to try and keep at least 1 lane of traffic moving at all times. What would be much safer for all would be an Oxford Circus style crossing where all the traffic stops and all pedestrians can move across in one go. As a pedestrian it is very frustrating that you cant cross York Way in one go, although the long rumoured pelican crossing further up York Way would help as I’m sure a lot of pedestrians want to cross and move up York Way. The problem here is if you do this you will lower the amount of traffic that can get though Kings Cross. Maybe part of the solution here would be to provide alternatives so all traffic isn’t funnelled up thru the gyratory. Though this will only upset others elsewhere of course! The gyratory should definately be removed IMHO, it’ll be very insteresting to see what routes people use when they actually have a choice, and to see the resulting enlivening of the KX community… Meanwhile, TfL’s short term ‘improvement’, would it be useful if the new ‘second’ lane going through from GIR to YW were a cycle lane???? I was a bit disturbed today to come across this TfL response to a FoI request for info on the safety audits for the Olympic Route Network . After all, safety is their top priority, or so Leon Daniels tells us. implementation of the ORN, which is a critical requirement for the Games. Lots of great ideas here – if only Tfl would take this seriously, as opposed to making cosmetic changes, then a needless death may be the last such tragedy here. I particularly like the idea that a green light for cyclists only precedes the green for other road users. That way cyclists will get away from the danger area before bullying, inconsiderate lorries and cars take off with their usual disdain for everybody else. I also agree that the narrowing from two lanes to one is a real danger – I speak as a pedestrian here, and it is just as dangerous for those of us on foot. Instead of moving the transition, it would surely make a lot more sense to make the approach to the junction one lane only. I don’t care if it means a tailback of cars – you cannot simply endanger other people for the sake of impatient drivers who presume, like Tfl, that they own the roads. It is crucial to remember that with the development around KX, pedestrians and cyclists will increase their numbers. Therefore radical, and intelligent, approaches are vital – not that you expect the latter quality from the moribund, stuck-in-the-past Tfl, who appear desperate to preserve the status quo, which is not possible even it it was desirable. Cyclists and pedestrians should have priority over motor traffic at this junction for the very simple reason that they are increasing rapidly in number, improve the area by not driving, and pay their taxes too, and thus deserve consideration in proportion to their numbers, as opposed to the one car drivers who think it is their right to have the traffic system designed for them alone.